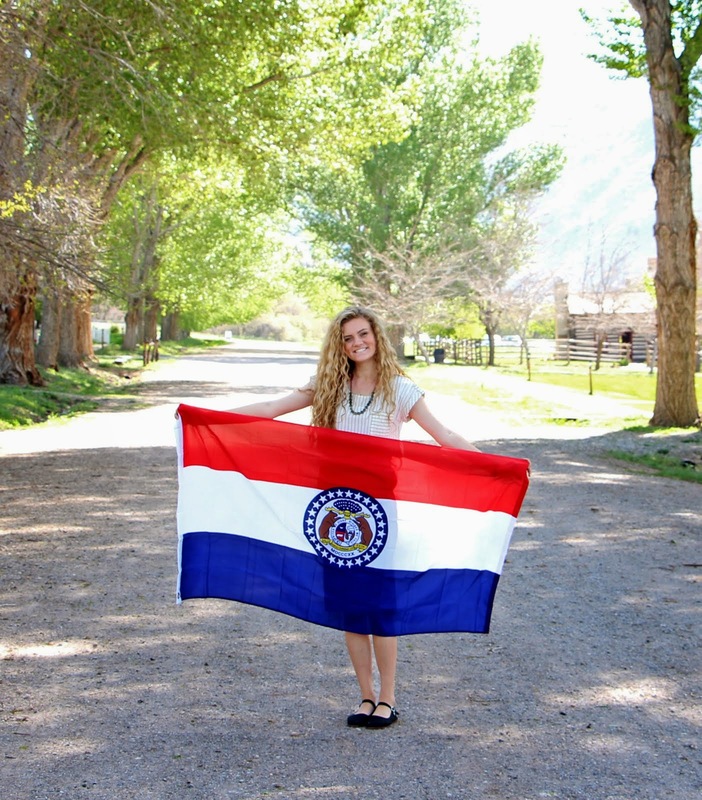 I still cannot believe that that will actually be happening soon and as Joseph Smith said while he was in the Liberty Jail, "I cannot say the smallest part which I feel"
I have just loved being a missionary. I am so grateful for this experience that Heavenly Father gave me to come to know Him better. It all feels like a dream to me right now.. entering the MTC and having no clue what it was like to be away from my family for this long and leaving everything behind and still having dreams of what I wish I could post on Instagram (oops!) and then almost 19 months later having had the most spiritual experiences ever. Saying goodbye is going to be the hardest thing I have ever done and already is the hardest thing ever. We went over to the Russells last night to say goodbye and to have a short lesson and my heart literally broke. I am going to miss that family so much and all the people out here. I have met the most amazing people here. My heart hurts just thinking about what else to say in this email. I just want all of you to know how much our Heavenly Father loves all of us. I have felt His love for me so strongly throughout my mission as I have lived His gospel. He is always there for us and has a plan for all of us. I have seen that so much in my mission. I know that the experiences He gave me were needed for me. The companions I served with, the areas I served in, the members I met, the doors I knocked, the presentations I took at the Visitors Center and the Historic Liberty Jail, all of it. I know He was involved in the details of it all. I know that that love doesn't end when we take off the name tag though. I am grateful for the time I've had to wear the tag and for during that time the testimony that has been strengthened within me of my Savior Jesus Christ. I love Him and will serve Him throughout my life because what He has done for me. That is the most important thing I will bring with me when coming home. I know He lives and I know that He loves. There was no other good enough that could unlock the gate of heaven to let us in. I love you all so much, especially my dear family. You have no idea how much I have missed you all out here in Missouri. I am grateful we got to cheat a little bit back in May for the wedding but I want you all to know how grateful I am for you. I have been praying for you all constantly and I have been lifted and strengthened from your prayers and your love. I know that our Father in Heaven has been watching out for you all which I am so grateful for but I am excited to be able to see you all soon too. 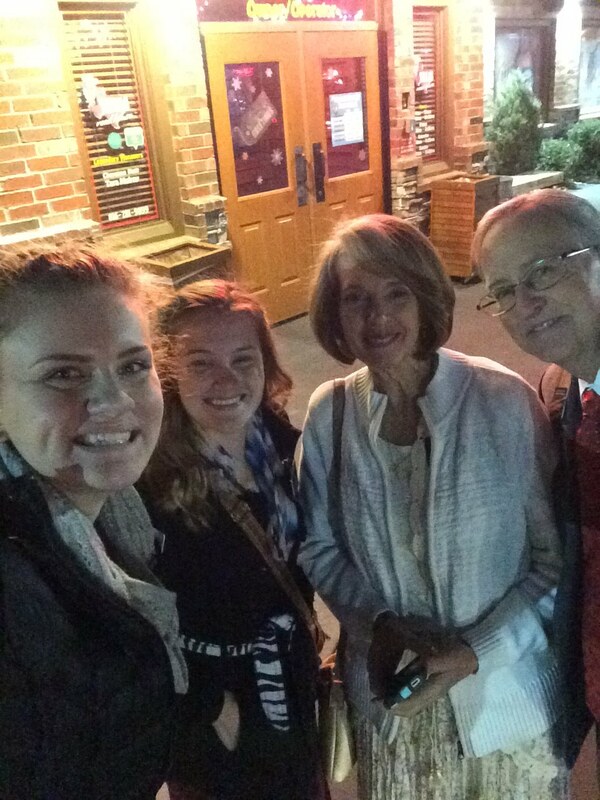 Families are so important in our Father's Plan and I have been able to feel that. He wants us to all be together forever and I know, especially now, how beautiful that part of the plan really is. We have to do everything while we are here now to make that possible. That is the goal. The beloved Russell family ❤️❤️ I am so grateful for this family. - the Lovells took us out to lunch today at my favorite place!! First Ice Storm in Missouri and hopefully last! Happy almost Christmas from good ole' Missouri!! I cannot believe how fast time goes. It is crazy to me that I have been serving at the Historic Liberty Jail for over 6 months already!!! I have taken like over 2,500 people through the jail and I still feel like I just got here. And Christmas is in like 5 days?! WHAT?! But anyways, this week has been so good! No car accidents, so that is always a plus! but we did get a MISSOURI ICE STORM!! I have never seen one of those the past 18 months I have lived here, but I guess I couldn't leave without one! Friday night-Sunday morning were crazy. Friday the roads were so icy that we were driving up the driveway to the jail parking lot and our car just slid straight down and luckily rotated enough where we could just casually drive back out like we meant to do that. lol. The "fleet got grounded" (aka, all the cars in the mission had to be parked) all day Saturday and a little bit of Sunday, so we were stuck inside to do "productive things" all day. We were planning to go down to the VC for a Christmas musical performance they had Saturday night with a member and some of their friends we want to start working with but they canceled it because of the weather AND they even canceled church on Sunday. I have never had church cancelled before. The weather was so weird. Friday was like an icy mist ALL DAY and then, it all froze by night and a thicker layer froze over night and so Saturday, everything was covered in ice. But Sunday was so awesome. 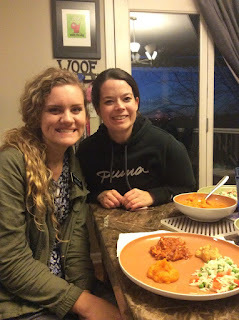 President Foley (in the Stake Presidency here in Liberty) invited us over to his house to take the sacrament with his family. We invited the other sisters at the jail to come with us too. It was the best sacrament meeting ever. President Foley turned it into a short testimony meeting after they passed the sacrament and then sister foley did a shortened version of her gospel principles class. It was so awesome. I was just so grateful for the sacrament all morning! 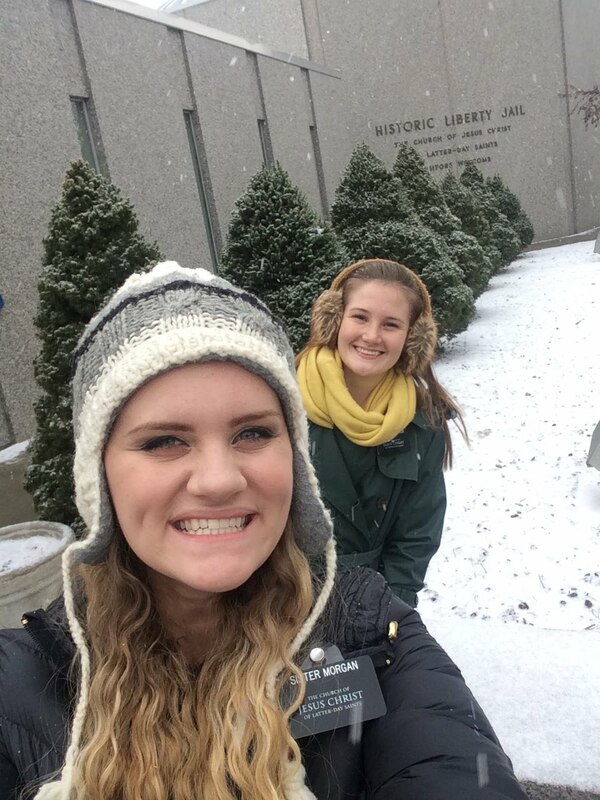 Before my mission, totally would have been stoked, or at least fine about church getting canceled if it was that cold so I could stay snuggled up in my bed all day but it was so sad this morning to possibly not take the sacrament. Huge tender mercy going to the Foleys. Also, it was just so powerful to see a family who loved the gospel so much that they truly wanted to keep the sabbath holy in the best way possible. So even church got cancelled, they all got in their Sunday clothes and held a sacrament meeting. I just loved it. We also had Zone Conference this week! It was super good as well. 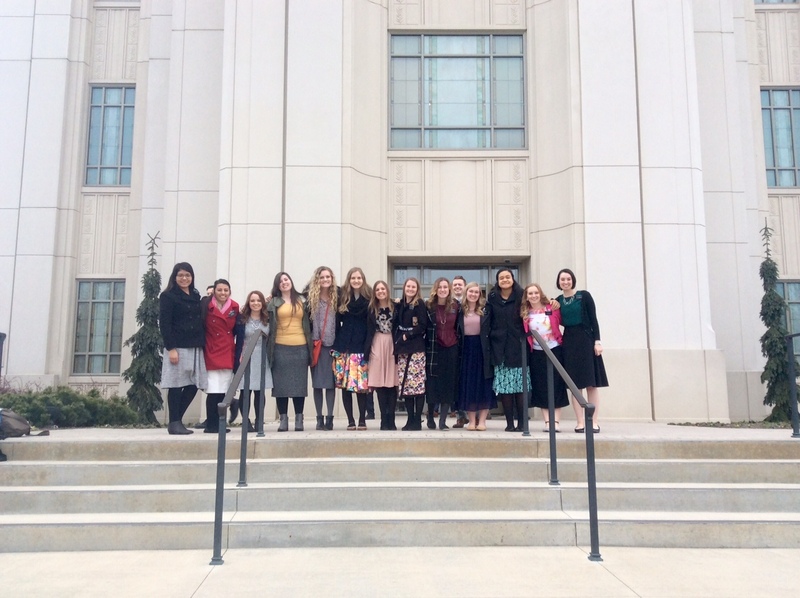 I am definitely so over these "lasts" and "departing testimonies" and such but it was so good! 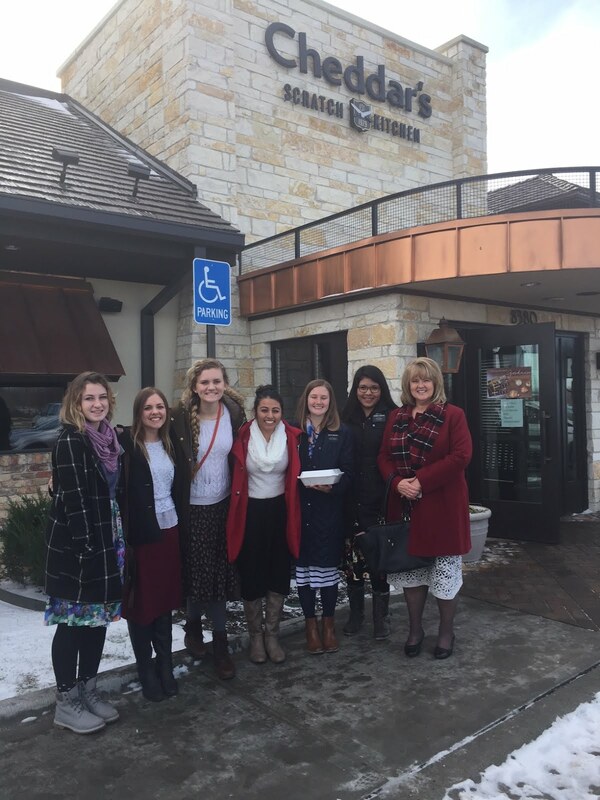 They did something new this year for Christmas and after zone conference, we all went to the temple with President and Sister Vest. Being in the celestial room with them was so amazing. 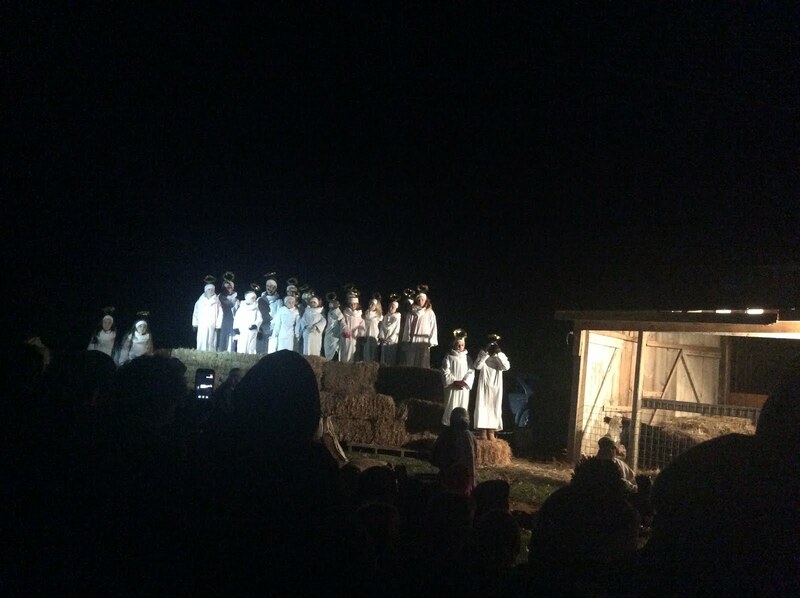 We sang at the nativity again last night in the freezing cold and it was just so peaceful! I love Christmas time and just getting to focus on the Savior and what He does for us. I am so grateful for a loving Savior and I am grateful for this time that I have to be a full time representative of Jesus Christ. I will forever cherish the experiences that I have had on my mission but mostly the love that I have been able to feel from Him as I have worked on living His gospel. Also, Sunday at President's Devotional, two of my favorite people came into the jail and bore their testimonies! Pauline and Joyce!!!!! 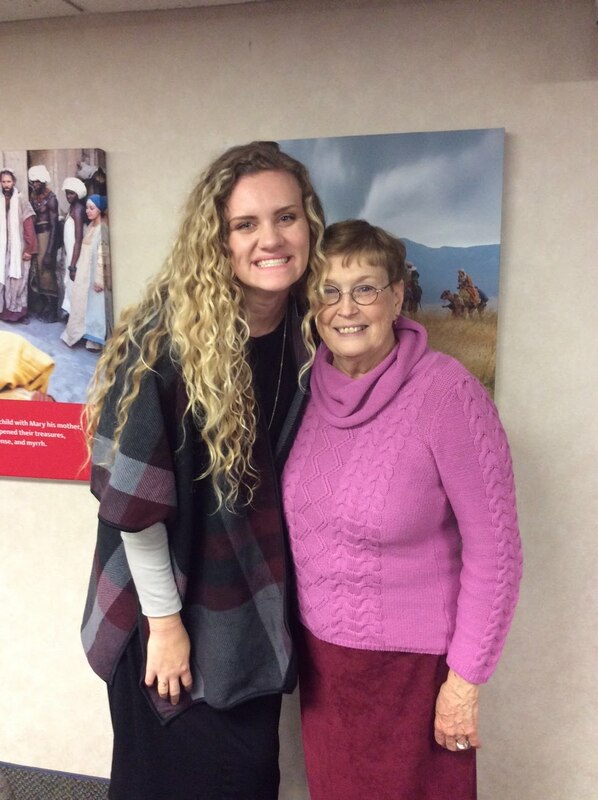 It was so amazing to hear their powerful testimonies of the Book of Mormon, especially Joyce. I needed to hear what she said so badly. I hope everyone has a wonderful Christmas this Sunday and that we are all able to feel the Spirit of who this season is really about. I can't wait to talk to some of the family Sunday as well! - sprinkling ice melt Saturday morning because it was impossible to walk anywhere!! A few more weeks of crazy adventures! So this week has been an adventure that's for sure! I got in my first car accident on my mission last night! Woo! haha just kidding it was like super scary and my comp and I have been in so much pain since then, but we are okay and alive! so it is all good! This week has flown by! Last Monday night, we went to the nativity that a few members put together for the community and we sang some Christmas songs before it started. I went to my last MLC on Wednesday which was like the worst thing ever. It was so sad. I had to bear my departing testimony at MLC. I don't really even know how to describe my feelings honestly. 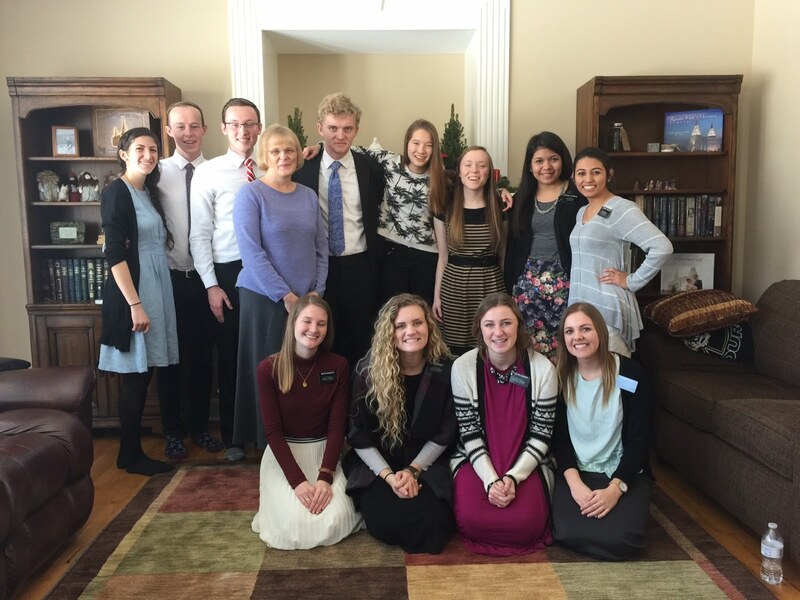 I just can't believe that I am at that point in my mission where departing testimonies even affect me. The time went by wayy faster than I ever imagined. Something that I shared at MLC that has become so meaningful to me recently though has been how the Savior really does know us. He totally understands what it feels like to feel like your "mission" was too short. 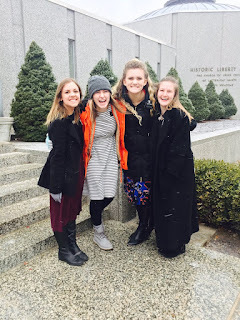 What it feels like to be sad to leave the amazing people you met on your mission and how it will be a rough transition. Everything. He understands. He listens. and most importantly, He loves. I am so grateful for a loving Savior. Friday we trained in Zone Training. I gave a training on the Role of the Holy Ghost. There was a scripture that I was reading in the Book of Mormon that I have just been thinking a lot about this week. It was in 3 Nephi 2:1. I was thinking of how remembering the experiences that we have had feeling the Holy Ghost helps us to not feel less astonished with the gospel. So many other things happened this week but those were the highlights! Until next week! 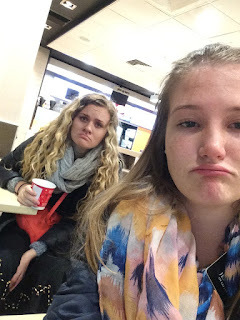 - after our car accident :( we got hot chocolate though! So time is like the weirdest thing in the world these days. 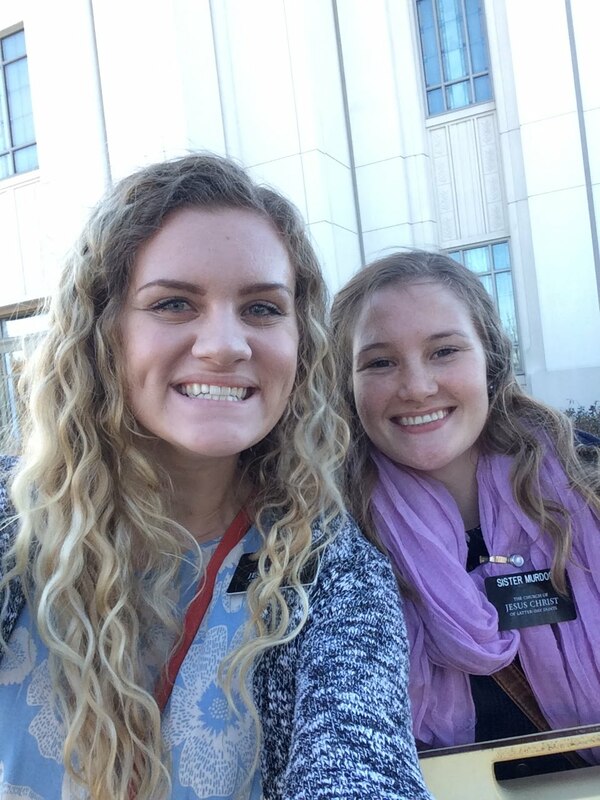 I feel like I have been on my mission for maybe 5 months but Saturday was my 18 month mark! So weird! I was actually on exchanges that day with .... Sister Jones!! My MTC companion. We were feeling a little nostalgic but it was cool to hear the things that we have improved on since being little babies in the MTC not knowing a thing about missionary work or the gospel in general. The exchange was so fun! AND in the morning since 4 of the sisters that we were in the MTC with in the same district are all up here at the jail, we decided to throw a party! 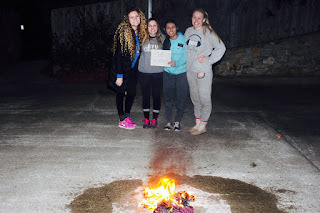 and by party I mean, wake up even earlier than we normally do and burn old gross skirts that we have worn our whole mission on our driveway, shed a tear, and then take a picture! This week has just been super weird. It doesn't feel real at all yet but then I hit all of these "lasts" which is just so crazy. I had my last district lunch on Wednesday. I was on exchanges with Sister Dawson on Wednesday. And shout out to her! I just love her so much! We are homies and I am so grateful she lives with us at the house. She has such a fire for the work and is SO FUN to be around. I learned so much from her and definitely needed to be with her that day. I have been thinking a lot about God's love this week. I have re learned that God loves us so unconditionally. He knows us perfectly. That is something I am super grateful for this week. Thursday night, the Torontos took us out to dinner at Texas Roadhouse which was so sweet of them! I have loved getting to serve my mission with them as the VC directors. 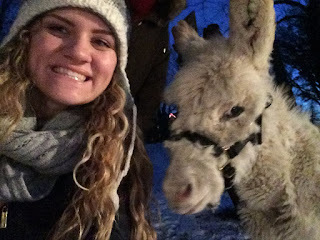 I also watched the Christmas Devo with Sister Toronto Sunday night while everyone else on shift was downstairs in the theatre and it was so fun! Friday morning, we had a lesson at the VC with a potential investigator! Sister Draper actually got to take us through the history too! She is SUCH A GOOD MISSIONARY! Seriously, she is so good at following the Spirit and helping our friend focus on the gospel of Jesus Christ personally. It was actually a super cool experience because we set this appointment up at the VC like a week and a half ago but hadn't been able to contact him since to confirm with him or anything and normally, since the lesson was all the way in Independence, we wouldn't have gone, but we decided to pray about it and ask Heavenly Father specifically if we should still drive down to Independence. We both felt like it wouldn't be a bad thing and that we should go. So we took the leap of faith and risked running out of miles for the month for no reason and he showed up! right on time! It was just a testimony builder for me to see that we can rely on the Lord in all things, even in just the small things. 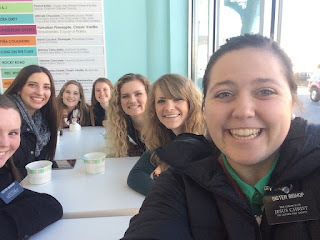 After running a few "errands" in Independence, we went to get frozen yogurt with our favorite sisters in Independence! On Friday, we had our ward Christmas party! I just love this ward so much! Friday was also our favorite Sister Russell's birthday and so we wanted to leave a surprise on her door while they were out at a concert and so we went to go drop it off and their gate to their driveway wasn't working but we were not about to just leave. 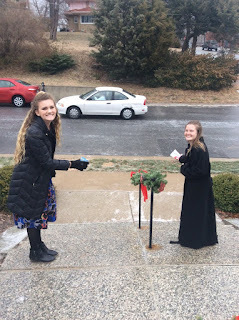 we ended up climbing over the fence and running in the freezing cold the like half mile up to their house to drop off her surprise and then running back. haha it was so fun! other things... oh! funny story from last transfer that I meant to write about but forgot to.. so this one time my companion (who shall remain nameless) and I were praying to start companionship study and so she starts praying and asks for us to have the Spirit with us and the normal things and then says, "and please bless us as we vaccuum" I looked over at her and was like what? she looked up and said in the most panicked voice, "I just fell asleep!!!" and then just finished the prayer. hahaha it was the funniest thing ever. It was so hard to not laugh during the rest of the prayer. But, the reason I am telling you this story is because this week, during church, in Sunday School, Sister Foley showed us the Mormon message called, "Earthly Father, Heavenly Father" (you all should go watch it to understand this) but it talks about the love that our earthly father and Heavenly Father has for us and one line that stood out to me was when this dad's little kid calls him from his wife's phone while he is at work and he says, "the phone rings, I hear breathing, I smile". I think that is the same thing with prayer with us sometimes. Sometimes, we know how to pick up the phone and dial to talk to our Heavenly Father but we don't know what to say (or in my companion's case, say the wrong thing because we are tired). But HE still smiles. He loves us unconditionally. He wants to hear from us. He already knows us perfectly but He wants to know that we WANT to talk with Him and rely on Him. I know that prayer is so real. The experiences that I have had this week confirmed to me again that He loves us perfectly. I know that that love that I felt from Him wasn't only for me, but it is for you as well. Pray and ask Him how He feels about you or how much He loves you. I promise that you will get an answer and you will feel of His never-ending, abiding love. I love this gospel so much. Here's to another week in Liberty! We have MLC tomorrow, we are going to the temple on Thursday for a sealing in my companion's old area, zone training the next day and lots of other things so this week will be a crazy one but I am grateful for the time that I have to be a missionary. It really is the best ever. 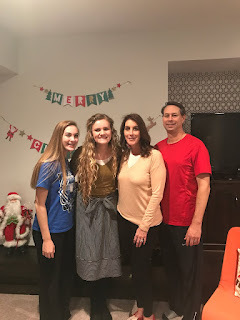 - #LIGHTtheWORLD has been the best thing ever for us out here! 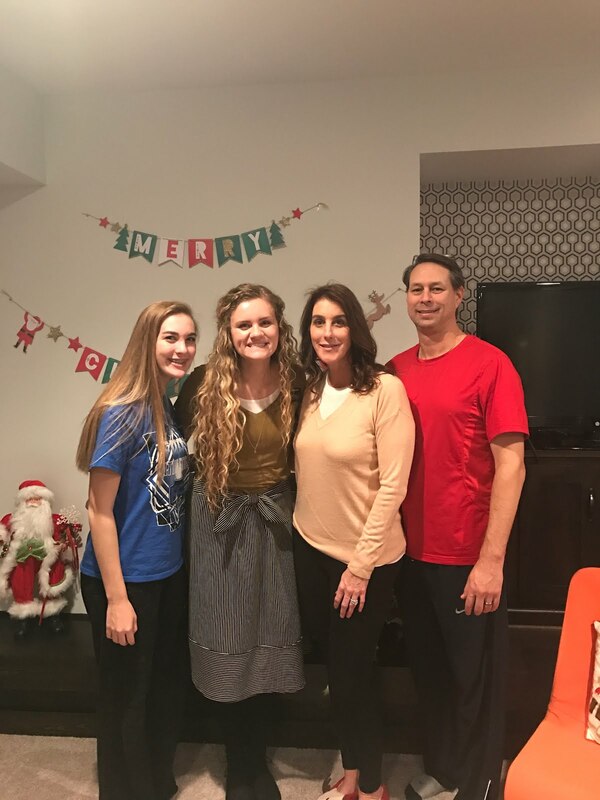 - honoring our mission parents for #LIGHTtheWORLD. One of the "errands" we did while we happened to be in independence. I absolutely love the Vests. Light the World with Service!! Yesterday was awesome! We got to go to an FHE with the Jensen family. dinners and then we went to our round 2 of FHE at the Russell's! into that house since I had left! had a good chat. We also were matching!! 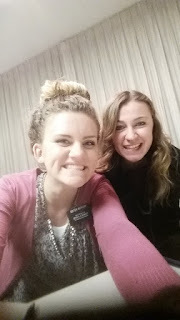 - Sister Guerrero and I in exchanges!